List of Oriya newspapers and Odia news sites including Sambad, Dharitri, Pragativadi, Samaja, Samaya epaper, Bhaskar, E News Odia, and Orissa Post. One of the top selling Oriya-language daily newspapers. 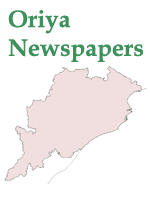 Oriya-language newspaper based in Bhubaneswar, Orissa. Leading daily Oriya newspaper published in Bhubaneswar. Founded in 1919 the Samaja is one of the oldest Oriya newspapers. The newspaper printed in Cuttack, Bhubaneswar, Berhampur, Balasore, Sambalpur, Rourkela, Vizag, and Kolkata. Web portal based in the state of Orissa. Providing news and information from the eastern Indian state of Orissa. Odia newspaper, published in New Delhi. Official web portal of the Government of Orissa. Featuring information about various tourist places including Rourkela, Baripada, Similipal, Sambalpur, Balasore, Keonjhar, Bolangir, Dhenkanal, Cuttack, Phulbani, Bhubaneswar Bhawanipatna, Konark, puri, Chilika, Berhampur, and Jeypore. Incorporated in Tennessee as a non-profit corporation for promoting activities of Oriya culture and exchange of information among Orissa, United States, and Canada.